After launching Nokia X6 in China last month, HMD Global is said to be planning the global rollout of the device. Now, it looks like Nokia X6 India launch is also nearing as the support page on the official India website goes live. Nokia X6 was launched in China last month with a notched display, a powerful processor, and a dual-camera setup with ZEISS optics. The phone has been a great hit in China and it was sold out within seconds during its first sale in China. The company has since been planning to bring the phone to global markets. HMD’s CPO, Juho Sarvikas has also created a poll on Twitter if the company should globally launch the Nokia X6. Now, it looks like the phone will soon be heading to global markets including India. We have spotted the support page of the Nokia X6 on the Indian website. The Nokia X6 features an attractive glass and aluminum design. Up front, there is a 5.8-inch IPS LCD display with FHD+ (1080×2280 pixels) resolution and Corning Gorilla Glass 3 protection. Interestingly, this is the first Nokia smartphone with 19:9 aspect ratio display i.e. a notch on top. The runs Android 8.1 Oreo out of the box. It is powered by the Snapdragon 636 processor coupled with 4GB or 6GB of RAM, and 32GB or 64GB of internal storage. The storage is expandable with microSD card up to 256GB. For imaging, the Nokia X6 features a dual-camera setup at its rear with a 16MP primary sensor that has f/2.0 aperture, 1.0µm pixel size, PDAF, EIS, and a 5MP sensor with f/2.2 aperture, 1.2µm pixel, and dual-tone, dual-LED flash. Up front, there is a 16MP camera with f/2.0 aperture and 1.0µm pixels. For connectivity, Nokia X6 also features Wi-Fi ab/g/n/ac (2.4GHz and 5GHz), Wi-Fi Direct, Bluetooth 5.0, GPS, USB 2.0 Type-C port, and a 3.5mm headphone jack. It gets powered by a 3060mAh battery with Quick Charge 3.0 support. 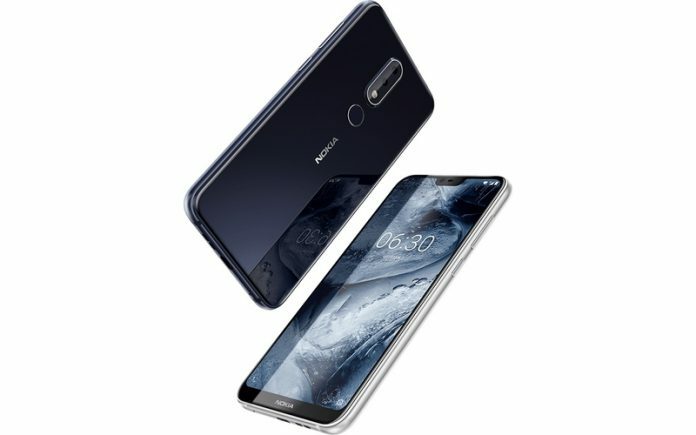 The Nokia X6 is priced in China at CNY 1,299 (approx. Rs. 13,600) for the 4GB RAM and 32GB storage variant, while the 4GB RAM+64GB storage variant is priced at CNY 1,499 (Rs. 15,700 approx.). The 6GB RAM+64GB storage variant is priced at CNY 1,699 (roughly Rs. 17,800). We expect HMD Global to launch Nokia X6 with the same price tag in India.